Reading and share top 14 famous quotes and sayings about California Love by famous authors and people. 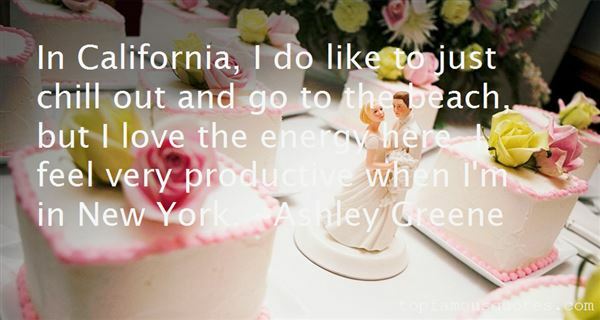 Browse top 14 famous quotes and sayings about California Love by most favorite authors. 1. "If you've had good gin on a hot day in Southern California with the people you love, you forget Nebraska. The two things cannot coexist. The stronger, better of the two wins." 2. "In California, I do like to just chill out and go to the beach, but I love the energy here. I feel very productive when I'm in New York." 3. "Before I lived in America, my husband and I did a Californian road trip. We took a month, starting off in L.A. I love the landscapes of California: one moment you're in the desert, the next you're up in the Napa Valley or by the water in Big Bear." 4. "I grew up on the beaches of Southern California surfing and sailing and I've always loved horses so it was part of my dream that I was able to fulfill to have horses." 5. "I was in California when this journalist made a blanket statement about the fact that she did not think that black men and women had the kind of love relationship that Rebecca and Nathan had in Sounder." 6. "Contiguous, adj.I felt silly for even mentioning it, but once I did, I knew I had to explain. "When I was a kid, "I had this puzzle with all fifty states on it--you know, the kind where you have to fit them all together. And one day I got it in my head that California and Nevada were in love. I told my mom, and she had no idea what I was talking about. I ran and got those two pieces and showed it to her--California and Nevada, completely in love. So a lot of the time when we're like this"--my ankles against the backs of your ankles, my knees fitting into the backs of your knees, my thighs on the backs of your legs, my stomach against your back, my chin folding into your neck--"I can't help but think about California and Nevada, and how we're a lot like them. If someone were drawing us from above as a map. that's what we'd look like; that's how we are." For a moment, you were quiet. And then you nestled in and whispered. "Contiguous." And I knew you understood." 7. "I love California. I love Hollywood." 8. "I drank a little California Mountain Red at home and thought--why not--wherever you turn someone is shouting give me liberty of I give you death. Perfectly sensible, thing-owning, Church-fearing neighbours flop their hands over their ears at the sound of a siren to keep fallout from taking hold of their internal organs. You have to be cockeyed to love, and blind in order to look out the window at your own ice-cold street." 9. "Dean's California--wild, sweaty, important, the land of lonely and exiled and eccentric lovers come to forgather like birds, and the land where everybody somehow looked like broken-down, handsome, decadent movie actors." 10. "If there was any other place I would live, other than Miami, it would be California. It's beautiful. 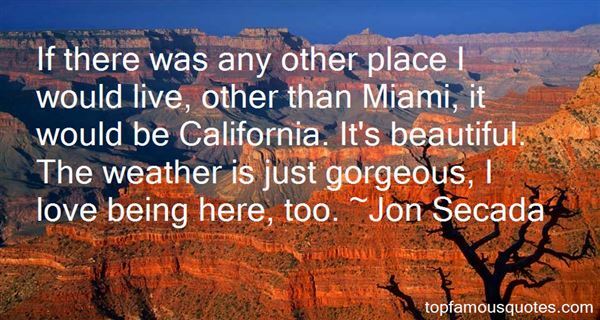 The weather is just gorgeous, I love being here, too." 11. "I guess I really always wanted to act. When I was seven, I actually had the opportunity to come out to California. I've always really loved playing a part, playing a character and being someone else." 12. "I think Dr. Willis McNelly at the California State University at Fullerton put it best when he said that the true protagonist of an sf story or novel is an idea and not a person. If it is *good* sf the idea is new, it is stimulating, and, probably most important of all, it sets off a chain-reaction of ramification-ideas in the mind of the reader; it so-to-speak unlocks the reader's mind so that the mind, like the author's, begins to create. Thus sf is creative and itinspires creativity, which mainstream fiction by-and-large does not do. We who read sf (I am speaking as a reader now, not a writer) read it because we love to experience this chain-reaction of ideas being set off in our minds by something we read, something with a new idea in it; hence the very best since fiction ultimately winds up being a collaboration between author and reader, in which both create and enjoy doing it: joy is the essential and final ingredient of science fiction, the joy of discovery of newness." 13. "One such father, decades ago now, John Quinn, a student at Humboldt State College in Arcata, California, made newspaper headlines when he chained himself to his laboring wife in order to foil the hospital ban on his presence. His explanation is a classical example of the increased awareness of the younger generation: "I love my wife. I feel it's my moral right as a husband and father to be there." 14. "Growing up in northern California has had a big influence on my love and respect for the outdoors. When I lived in Oakland, we would think nothing of driving to Half Moon Bay and Santa Cruz one day and then driving to the foothills of the Sierras the next day." In the world I see you are stalking elk through the damp canyon forests around the ruins of Rock feller Center. You'll wear leather clothes that will last you the rest of your life. You'll climb the wrist-thick kudzu vines that wrap the Sears Towers. And when you look down, you'll see tiny figures pounding corn, laying stripes of venison on the empty car pool lane of some abandoned superhighways."